Antoninus Pius died at Lorium on March 7th, 161, and was suceeded by Marcus Aurelius who had been selected by Hadrian as the eventual heir to the throne. Obverse: ANTONINVS AVG PIVS P P, laureate head left. Reverse: AVRELIVS CAES AVG PII F COS DES, bare head of Marcus Caesar right. Obverse: ANTONINVS AVG PIVS P P TR P COS III, Bare head of Antoninus Pius right. Reverse: AVRELIVS CAESAR AVG PII F COS, Bare head of Marcus Caesar right. 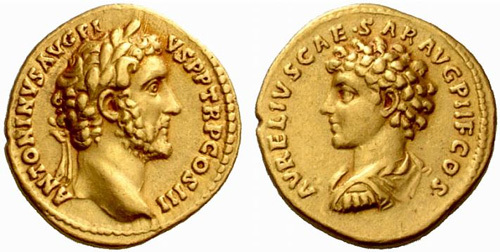 Obverse: ANTONINVS AVG PIVS P P TR P COS III, Laureate head of Antoninus Pius right. 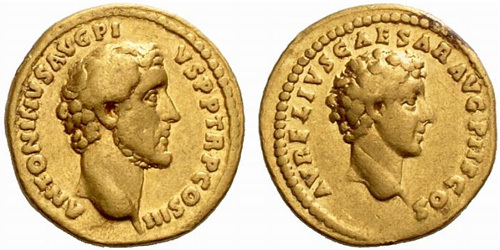 Reverse: AVRELIVS CAESAR AVG P II F COS Bare-headed draped and cuirassed bust of Marcus Aurelius left. Obverse: ANTONINVS AVG PIVS P P TRP COS III, Laureate, draped and cuirassed bust right. Reverse: AVRELIVS CAESAR AVG P II F COS, Bare-headed, draped and cuirassed bust left. 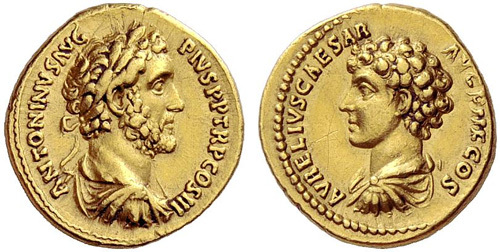 Obverse: ANTONINVS AVG PIVS P P TR P COS III, Bare bust of Antoninus Pius left, with drapery on left shoulder. 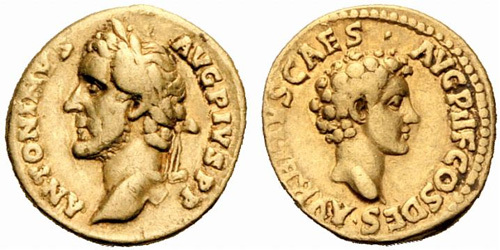 Reverse: AVRELIVS CAES AVG PII F COS, Bare head of Marcus Aurelius left. Obverse: ANTONINVS AVG PIVS P P TR P COS III, Laureate bust of Antoninus Pius left. 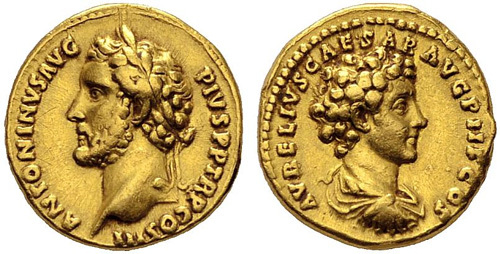 Reverse: AVRELIVS CAESAR AVG PII F COS, Bare head of Marcus Aurelius right, draped, cuirassed. Reverse: AVRELIVS CAES AVG PII F COS, Bare head of Marcus Aurelius right, draped.